Designed with vanes that have small pin holes to allow filtered light to enter the room. 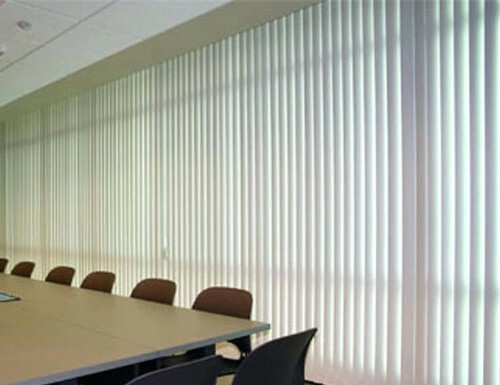 Perforated vertical blinds are a great way to reduce glare without blocking all the light. Because they have small perforated holes in the vanes they are not a complete privacy blind. Shop for your vertical blinds at Blinds Chalet! Perforated vertical blinds are a practical application for offices, businesses or any location where light control is a necessity. When you shop for vertical blinds from Blinds Chalet, each perforated vertical blind comes standard with a dust cover valance at no additional charge. W: 12" 13" 14" 15" 16" 17" 18" 19" 20" 21" 22" 23" 24" 25" 26" 27" 28" 29" 30" 31" 32" 33" 34" 35" 36" 37" 38" 39" 40" 41" 42" 43" 44" 45" 46" 47" 48" 49" 50" 51" 52" 53" 54" 55" 56" 57" 58" 59" 60" 61" 62" 63" 64" 65" 66" 67" 68" 69" 70" 71" 72" 73" 74" 75" 76" 77" 78" 79" 80" 81" 82" 83" 84" 85" 86" 87" 88" 89" 90" 91" 92" 93" 94" 95" 96" 97" 98" 99" 100" 101" 102" 103" 104" 105" 106" 107" 108" 109" 110" 111" 112" 113" 114" 115" 116" 117" 118" 119" 120" 121" 122" 123" 124" 125" 126" 127" 128" 129" 130" 131" 132" 133" 134" 135" 136" 137" 138" 139" 140" 141" 142" 143" 144" 145" 146" 147" 148" 149" 150" 151" 152" 153" 154" 155" 156" 157" 158" 159" 160" 161" 162" 163" 164" 165" 166" 167" 168" 169" 170" 171" 172" 173" 174" 175" 176" 177" 178" 179" 180" 181" 182" 183" 184" 185" 186" 187" 188" 189" 190" 191" 192" 0/0"1/8"1/4"3/8"1/2"5/8"3/4"7/8" H: 12" 13" 14" 15" 16" 17" 18" 19" 20" 21" 22" 23" 24" 25" 26" 27" 28" 29" 30" 31" 32" 33" 34" 35" 36" 37" 38" 39" 40" 41" 42" 43" 44" 45" 46" 47" 48" 49" 50" 51" 52" 53" 54" 55" 56" 57" 58" 59" 60" 61" 62" 63" 64" 65" 66" 67" 68" 69" 70" 71" 72" 73" 74" 75" 76" 77" 78" 79" 80" 81" 82" 83" 84" 85" 86" 87" 88" 89" 90" 91" 92" 93" 94" 95" 96" 97" 98" 99" 100" 101" 102" 103" 104" 105" 106" 107" 108" 109" 110" 111" 112" 113" 114" 115" 116" 117" 118" 119" 120" 121" 122" 123" 124" 125" 126" 127" 128" 129" 130" 131" 132" 133" 134" 135" 136" 137" 138" 139" 140" 141" 142" 143" 144" 0/0"1/8"1/4"3/8"1/2"5/8"3/4"7/8"
is it made out of material or pvc? They are made from PVC vanes that have small pin holes in them that allow filtered light to pass through them. Excellent product. Very nice to have some shade coverage and also a view. I went from while to grey and the grey is much easier on the eyes and the view is better!! Purchased these blinds for the office, like that they are transparent. Purchased these blinds for the office, like that they are transparent. I was skeptical about measuring and ordering on-line, but everything went smoothly and the blinds fit perfectly. Great service - great blinds. Don't hesitate to buy from them. Add three extra matching vanes with your purchase. This an ideal purchase for areas in the home that are exposed to high traffic, children or pets. Select the side of the blind for the draw control location. The draw control is used to open and close the blinds. For a cord control, the draw position will be on the same side where the blinds stack. For a wand control, the draw position will be on the opposite side of where the blinds stack. Specify the location of where the vanes gather when the blinds are drawn open.